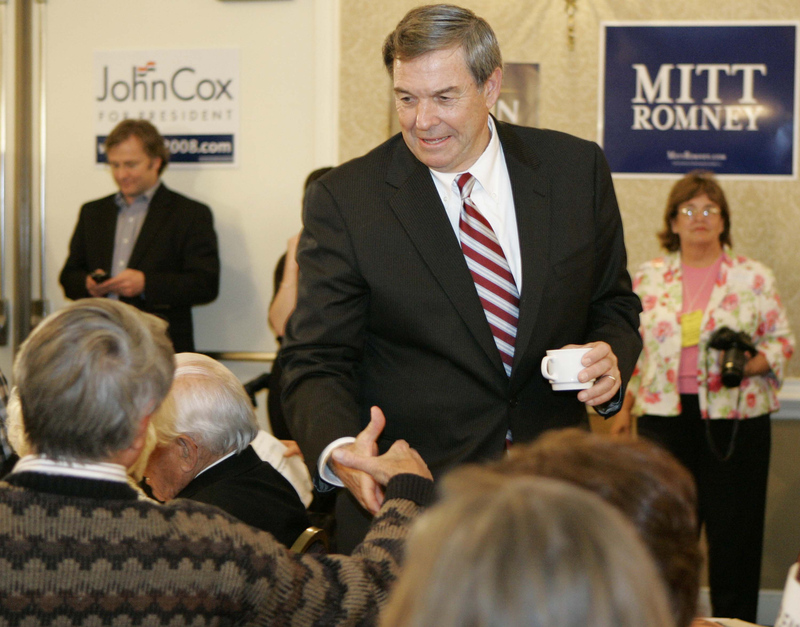 Republican Presidential hopeful Duncan Hunter shakes hands with delegates before addressing the Charleston County GOP convention on April 13, 2007, in Charleston, S.C.
Hunter's Credentials: Hunter is 26-year congressional veteran who represents the eastern suburbs of San Diego. A former Army Ranger who won a Bronze Star, Hunter narrowly defeated an 18-year Democratic incumbent in 1980 to win his congressional seat. Hunter was part of the so-called "Reagan Revolution" that brought Republicans into power in hitherto Democratic strongholds. Before the next election, redistricting made his seat more strongly Republican, and he has never been seriously challenged in his 13 re-election bids. From 2002-2006, he chaired the House Armed Services Committee and is now its ranking Republican member. Hunter has been a supporter of U.S. efforts in Iraq and has worked for funding for those efforts and in making sure the U.S. military remains second to none in the world. In April 2007, he called for Senate Majority Leader Harry Reid, D-Nevada, to resign his leadership position after Reid said "the war is lost." Hunter said Reid's pronouncement would demoralize troops and be used as a recruitment tool and rallying force for terrorists and put U.S. troops in harm's way. Hunter was the first announced candidate for the 2008 presidential race, getting into the running on Oct. 30, 2006. Place of Birth: Riverside, Calif.
Children: Duncan Duane Hunter, Sam Hunter and four grandchildren. Experience: Hunter was elected to the U.S. House of Representatives in 1981 and is still serving in Congress today. He represents California's 52nd District. Notable: Hunter volunteered service in the Vietnam War where he served in the 173rd Airborne and the 75th Army Rangers and was awarded a Bronze Star. Upon returning, he put himself through college with the G.I. Bill and worked in farming and construction to supplement his income. He lost his home in Alpine, Calif. due to the October 2003 wildfires, but has since finished rebuilding it. His oldest son, Duncan Duane Hunter, has served two tours in Iraq in the U.S. Marine Corps. Hunter on the Issues: A look at where Hunter stands on the issues and how he has voted. Nevada Contributions: A breakdown of Hunter's financial contributions from the Silver State. State by State Contributions: A breakdown of Hunter’s financial contributions across the U.S.
Hunter's MySpace page: Read Hunter's profile information and leave a message. Hunter's Facebook page: Read Hunter's profile information and leave a message. Hunter's Flickr page: View Hunter's latest photos from the campaign trail. YouTube Videos: View Hunter's latest political videos. Hunter's Blog: View Hunter's official political blog. Campaign Manager: Roy Tyler and more key people.